Prime Minister Narendra Modi’s office does not think that it is obligatory on its part to reveal even elementary information about the date-wise number of visits made by a top tycoon to his official residence in Delhi. 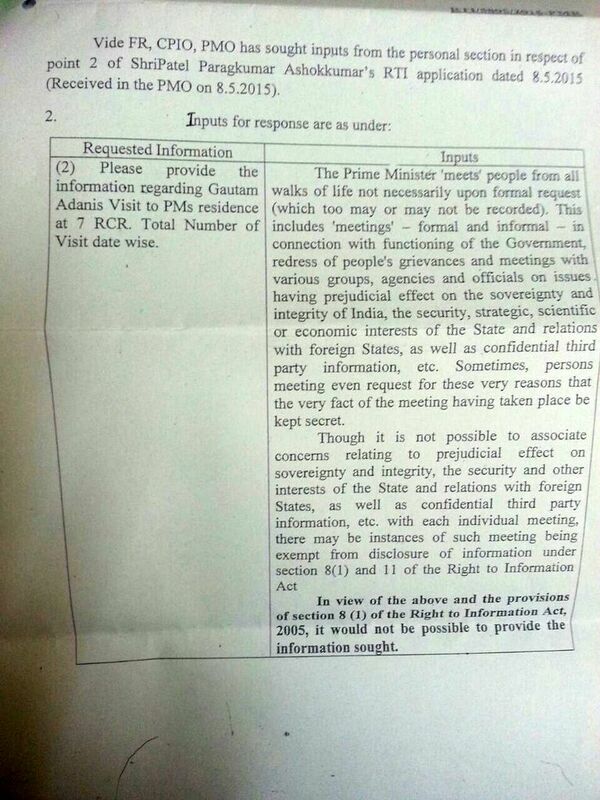 This has come from a right to information (RTI) plea by a Gujarat-based citizen by Paragkumar Ashokkumar Patel, who wished to “total number of visits, datewise” by Gautam Adani. 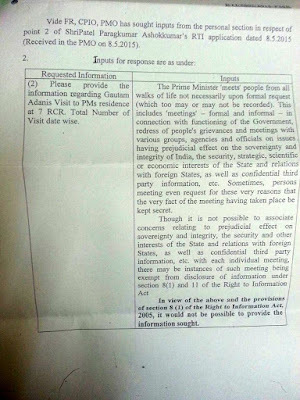 Replying to the RTI plea, which reached the Prime Minister’s Office (PMO) on May 8, 2015, the PMO said, “The Prime Minister meets people from life not necessarily upon formal request”, which “may or may not be recorded”. 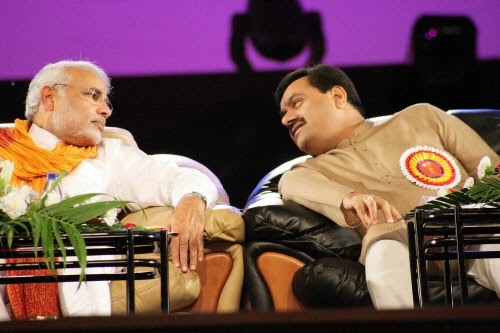 Adani, who has emerged lately as the most powerful tycoon of India, is known to be close to Modi for long. Section 8 provides that no information should be disclosed if it creates an unwarranted invasion of the privacy of any individual, while Section 11 suggests that information may not disclosed if it relates to the third party wants it to be treated as confidential. Section 11 has been applied despite the fact that Shailesh Gandhi, a former central information commissioner had ruled that it does not give an unrestrained veto to refuse disclosing information, but only an opportunity to voice its objections to disclosing information. This is the second major instance in about a week’s time when officials around Modi have refused to provide information under the RTI. Earlier, the Cabinet Secretariat, Government of India, refused information about the reasons behind sacking of ex-foreign secretary Sujatha Singh early this year. Well-known RTI activist Venkatesh Nayak, who filed the RTI plea, said, “The Cabinet Secretariat has denied access to the Cabinet note and the list of people who attended the Appointments Committee of the Cabinet (ACC) meeting as well as all related file notings”, claiming the matter is sub judice.